Biutiful is the latest film by Mexican director, Alejandro González Iñárritu. It tells the story of Uxbal (Javier Bardem), a petty criminal in Barcelona. He supplies goods from a sweatshop to undocumented African immigrants to sell on the street. He also bribes police officers to look the other way while this is going on. Uxbal leads an essentially parasitical existence, and he is clearly conflicted about it. He tries to make up for it by helping other people in various ways, but his efforts are not always successful, and in one instance the results are tragic. At the same time he tries to hold together his marriage with his wife, Marambra (Maricel Álvarez), who suffers from bipolar disorder. On top of all this, Uxbal has been diagnosed with cancer. Biutiful is a well-crafted and convincing drama. My only criticism is of the supernatural elements in the film. It appears that Uxbal has the ability to communicate with dead people. (Such an ability would clearly be financially lucrative. So why does Uxbal have to lead a meagre existence as a not very successful criminal?) This idea is never incorporated into the story in a dramatically interesting manner. For the most part it merely means that at certain moments Uxbal looks up and sees the spirits of dead people stuck to the ceiling. For me, this whole business was merely a distraction from the main story. I would have preferred it if the film had consistently maintained its gritty realism throughout. Aside from this, I found this film deeply moving. 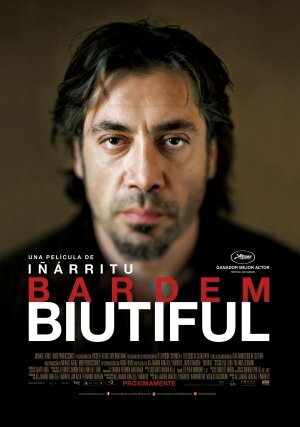 Javier Bardem’s performance is powerful; he should have won the Oscar for Best Actor. This entry was posted on May 22, 2011 at 7:58 am and is filed under Cinema. You can follow any responses to this entry through the RSS 2.0 feed. You can leave a response, or trackback from your own site.